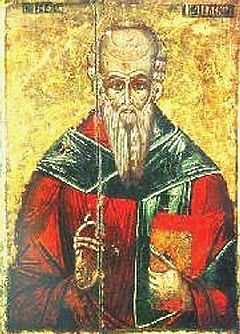 Clement of Alexandria (c. 150 – 215) (Titus Flavius Clemens) was an early Christian philosopher and one of the most distinguished teachers of the Church of Alexandria. He is known for his attempt to unite Greek philosophy with Christian teachings and drew a large number of educated pagans to the Church. His passion for philosophy, especially for the teachings of Plato, contributed to the "hellenization" of Christianity. Clement of Alexandria was, and still is, a highly unorthodox and controversial figure in Church history. Titus Flavius Clemens was born sometime during the middle of the second century C.E. Many scholars have named Athens as his birthplace, and this is supported by the classical quality of his Greek. His parents seem to have been wealthy pagans of some social standing. Clement traveled in Greece, Italy, and Palestine before settling in Egypt. While searching for a spiritual teacher, he came under the tutelage of Pantaenus, the head of the catechetical school at Alexandria and eventually succeeded him as the director of the school. Clement lectured candidates for baptism in the Gospels and Christian doctrine, inviting pagans and new converts to come listen. One of his most well-known pupils was Origen. In 202, the Roman Emperor Septimius Severus began persecuting Christians more severely and closed the catechetical school at Alexandria, forcing Clement to leave for Asia Minor. He is believed to have died sometime before 215. The trilogy of works which represent Clement's most important ideas is composed of the Protreptikos (Exhortation to Conversion), the Paidagogos (Moral Tutor), and the Stromateis (Miscellany). In his bold literary undertaking, Clement attempts to set forth Christianity for the faithful in the traditional forms of secular literature. There is a somewhat systematic progression among these three major works: The first is addressed to the unconverted pagan, the second to the new Christian, and the third appeals to the mature believer. The Protreptikos forms an introduction inviting the reader to listen, not to the mythical legends of the gods, but to the "new song" of the Logos, the beginning of all things and creator of the world. He denounces what he claims to be the folly of idolatry and the pagan mysteries, the shamefulness of the pederastic practices of the Greeks, and the horrors of pagan sacrifice. He argues that the Greek philosophers and poets only guessed at the truth, while the prophets set forth a direct way to salvation, and now the divine Logos speaks in His own person to awaken all that is good in the soul of person and to lead it to immortality. Having thus laid a foundation in the knowledge of divine truth, Clement goes on, in the Paidagogos, to develop a more systematic Christian ethic. He speaks of the "paidagogos," or tutor, as the divine Logos which guides the Christian throughout even the most mundane daily activities such as eating and sleeping. Like the Stoic Epictetus, Clement believes that true virtue shows itself through external evidence in the natural, simple, and moderate way of life of the believer. The Stromateis goes further and aims at the perfection of the Christian life by initiation into complete knowledge. It attempts, on the basis of Scripture and tradition, to give an account of the Christian faith that can answer all the demands of learned men and conduct the student into the innermost realities of his belief. Clement entitled the work Stromateis because it deals with such a variety of matters. He intended to make but one book of this, but at least seven grew out of it without his having treated all the subjects proposed. The absence of certain things definitely promised has led scholars to ask whether he wrote an eighth book, and various attempts have been made to identify with it short or fragmentary treatises appearing among his remains. The excerpts and selections which are designated as the eighth book in an eleventh century manuscript of Stromata are not parts of the Hypotyposes which Clement is known to have written. Besides the great trilogy, the only complete work preserved is the treatise entitled, Who is the Rich Man that Shall Be Saved? It is based on Mark 10:17-31 and lays down the principle that not the possession of riches but their misuse is to be condemned. There are also a few fragments of a treatise on the Passover, against the Quartodecimanism position of Melito of Sardis, and only a single passage from the "Ecclesiastical Canon" against the Judaizers. Several other works are known only by their titles. Clement's main contribution to the development of Church doctrine was his attempt to reconcile Christian teachings with the ancient Greek philosophers. He was a self-proclaimed eclectic as can be seen in his tolerating and even embracing non-Christian philosophy. It was a marked characteristic of his that he saw only superficial and transient disagreement where others found a fundamental opposition. Clement was able to reconcile, and even fuse, differing views to an extent which made it impossible to attribute to him a definite individual system. He replaced the apologetic method with the constructive or systematic method, turning the simple Church tradition into a scientific dogmatic theology. It was a commonly held view among Clement's contemporaries that philosophy was the creation of the Devil. Others saw the philosophers as simply unoriginal, and Clement himself stated that the philosophers owed a large part of their knowledge to the writings of the Old Testament. However, he still argued, "that philosophy in a sense is the work of Divine Providence" (Stromateis i, I). Clement saw Greek philosophy not as something irrelevant or opposed to Christianity but as an early stage of the progressive revelation of God's truth to human beings through the Logos. Just as the law of Moses was a "paidagogos" to the Jewish people preparing them to receive the Messiah, Clement believed that God also used philosophy to inform the Greeks and to eventually guide them to the fullness of truth in Christ. The knowledge of the ancient Greeks was far surpassed by the revelation given through the law and prophets of the Old Testament, and that was further surpassed by the direct revelation of the incarnate Logos in Jesus Christ. Clement did not, however, embrace all schools of Greek philosophy; he denounced the Sophists as well as the Hedonists of the school of Epicurus. Although he generally expressed himself unfavorably in regard to Stoicism, he clearly paid deference to the mixture of Stoicism and Platonism which characterized the religious and ethical thought of the educated classes in his day. In his ethical expressions, he was influenced strongly by Plato and the Stoics and borrowed much of their terminology. Clement praised Plato for defining man's ultimate aim in life as likeness to God and saw Plato's description of a transcendental and incorporeal God as accurate and aligned with Scripture. His teachings also included the Stoicist ethics of moderation, suppression of the passions, and the fulfillment of moral obligations, and his description of the perfect Gnostic closely resembles the Stoicist definition of the wise man. Clement counseled his students to shake off the chains of the flesh as far as possible, to live as if already out of the body, and thus, to rise above earthly things. He was a true Greek in the value which he placed on moderation, but his highest ideal of conduct was the mortification of all affections which may in any way disturb the soul in its career. Clement embraced this lofty ethical-religious ideal of the attainment of man's perfection in union with God, which Greek philosophy from Plato down had worked out, and connected it to Christianity and the ecclesiastical tradition. To him, it seemed only logical that the philosophical conclusions of the Greeks were so similar to their Hebraic counterparts. All men, he believed, were endowed by God with a "shared mind"—a natural intuition which seeks truth and righteousness. God also reveals His truth to people of all ages through divine revelation. Clement also emphasized the permanent importance of philosophy for the fullness of Christian knowledge. He explained with special predilection the relation between knowledge and faith, and he sharply criticized those who were unwilling to make any use of philosophy. He spoke of the importance of higher spiritual understanding, or "gnosis," which he clearly distinguished from "gnosis" as defined by the Gnostics. He taught that faith was the foundation of all knowledge and that both were given to people by Christ. Like Plato, Clement saw the world as an organic whole that was ultimately knowable to humans. Greater knowledge of God and the universe allows the believer to penetrate deeply into the understanding of what he believes, and this is the perfection of faith. In order to attain this "faith of knowledge," which is much higher than "faith of conjecture," philosophy is permanently necessary. In fact, Clement considered Christianity the true philosophy and the perfect Christian the true "Gnostic." This true philosophy includes within itself the freedom from sin and the attainment of virtue. As all sin has its root in ignorance, so the knowledge of God and of goodness is followed by good actions. He rejected the Gnostic concept of absolute predestination and the distinction between "psychic" and "pneumatic" men. He believed in the freedom to do good—that all people are destined to perfection if they will embrace it. Clement understood this Christian gnosis as the work of the Logos, through which God's relation to the world and his revelation is maintained. He considered God transcendentally as an unqualified Being. Though His goodness operated in the creation of the world, His divine essence is immutable, self-sufficient, and incapable of suffering. The Logos is most closely one with the Father, whose powers He resumes in Himself, but both the Son and the Spirit are "first-born powers and first created." They form the highest stages in the scale of intelligent being, and Clement distinguishes the Son-Logos from the Logos who is immutably immanent in God, and thus gives a foundation to the charge of Photius that he "degraded the Son to the rank of a creature." The Logos is separate from the world as the principle of creation, yet also in it as its guiding principle. Thus, a natural life is a life according to the will of the Logos. Clement's description of the Incarnation, in spite of Clement's rejection of the Gnostic Docetism, was somewhat Docetic in nature. He said that the body of Christ was not subject to human needs. Christ was the good Physician, and the medicine which he offered was the communication of saving gnosis, leading men from paganism to faith and from faith to the higher state of knowledge. For Clement, the way to this union with God was only the Church's way. The communication of the gnosis was bound up with holy orders, which gave the divine light and life, and the simple faith of the baptized Christian contained all the essentials of the highest knowledge. By the Eucharist, the believer was united with the Logos and the Spirit and made partaker of incorruptibility. Though Clement initially presented a purely spiritual conception of the Church, the exigencies of his controversy with the Gnostics forced him to put more stress on the Church as an official institution. An excerpt from the "Mar Saba letter," attributed to Clement of Alexandria, is the only evidence for the existence of a possible "Secret Gospel of Mark." Many later theologians and Church officials have opposed Clement's views. While his feast day is traditionally celebrated on December 4, Pope Clement VIII had Clement removed from the Roman martyrology due his unorthodox writings. Bigg, Charles. The Christian Platonists of Alexandria; The 1886 Bampton Lectures. Oxford: Clarendon P., 1968. Clement, and G. W. Butterworth. Clement of Alexandria; With an English Translation. Cambridge: Harvard University Press, 1953. Oulton, John Ernest Leonard, et al. Alexandrian Christianity; Selected Translations of Clement and Origen with Introductions and Notes by John Ernest Leonard Oulton and Henry Chadwick. Philadelphia: Westminster Press, 1954. "Exhortation to the Heathen," by Clement of Alexandria, The Catholic Encyclopedia. "The Paedagogus," by Clement of Alexandria, The Catholic Encyclopedia. "The Stromata," by Clement of Alexandria, The Catholic Encyclopedia. History of "Clement of Alexandria"
This page was last modified on 3 March 2017, at 17:47.